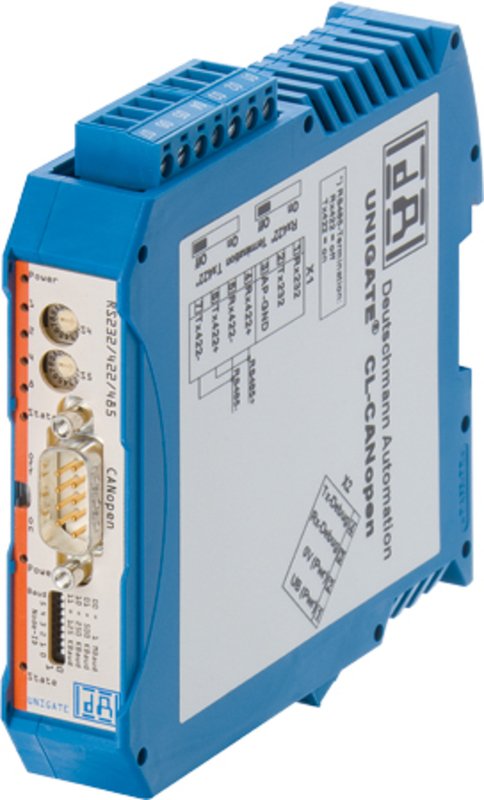 The Protocol Converter UNIGATE® CL connects devices via their serial interfaces with the desired ¬ fieldbus or Industrial Ethernet standard. RS232, RS485 and RS422 interfaces are on Board as a standard feature. The communication between the serial side and the bus takes place through the device con¬figuration and a selection of the commercially available protocol, such as Modbus ASCII, Modbus RTU (Master or slave), 3964 (R), RK512, DIN measuring bus, DIN 19244. For more complex applications the device can also be controlled by a script. The script is one of the special advantages of Deutschmann’s UNIGATE products. It implements the terminal device protocols. It can also be used to emulate complex protocols, buffer data, and process it in any desired manner. Customer specific commands can be integrated, operations can be linked with timer and event-based triggers, and all data and bus statuses can be displayed. Deutschmann provides the Protocol Developer tool free of charge which enables users to generate the script without special programming skills or fieldbus knowledge. Deutschmann offers to fit UNIGATE CL converters – just like all UNIGATE products – with OEM brand labels.